Agent K: I promised you the secrets of the universe, nothing more. Agent J: Well…what other secrets are there? Everyone nod you heads, because the black suits have come back. Still protecting the earth from the scum of the universe, the Men In Black have returned, but most importantly, they have redeemed themselves with an enjoyable third entry that gets better as it goes along. It has been a while since the last ‘Big Willie Weekend’, but Will Smith and everyone involved have managed to come up with a film that outshines its overblown production troubles. A lot of the same wit and humor that made the first film so enjoyable is present here, along with the strong makeup/effects work that has been present throughout the series. While it does take some time to really get going, the strong finish is what truly makes Men In Black 3 a worthwhile summer sci-fi comedy. The film opens with a jailbreak. The nefarious Boris the Animal (Flight of the Conchord’s Jermaine Clement) escapes from a prison located on the moon, and seeks revenge against the man who put him there – Agent K (Tommy Lee Jones). 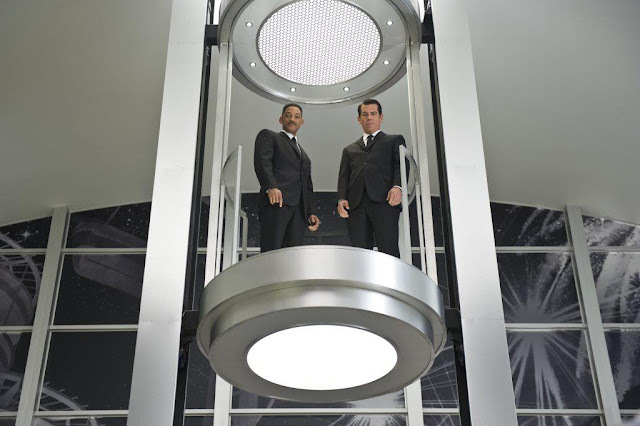 Back on earth, Agents K and J (Will Smith) are still veteran agents of MIB, taking care of extraterrestrial criminal activity. When Boris suddenly reappears on earth with a plan to attack, K is put off, but not entirely open with J as to why. Real issues emerge as Boris manages to time travel back to 1969 and assassinate K then, causing a disturbance in the present. J is one of the only people to realize what has happened and is forced to also go back in time, in order to prevent K’s death and stop certain doom from befalling the earth. Once back in time, J must work with a younger Agent K (Josh Brolin) in order to stop Boris from doing further harm. The first film in this series, which came out back in 1997, was a lot of breezy fun that was made better by the solid chemistry between Will Smith and Tommy Lee Jones, along with the superb makeup work handled by Rick Baker (I should also note that Vincent D’Onofrio is great as the villain in that film). The 2002 sequel was exactly what no one really wanted – an unnecessary film that still featured great makeup/visuals, but felt like an unclever retread of the first film, with a mishmash of ideas that never properly gelled together. 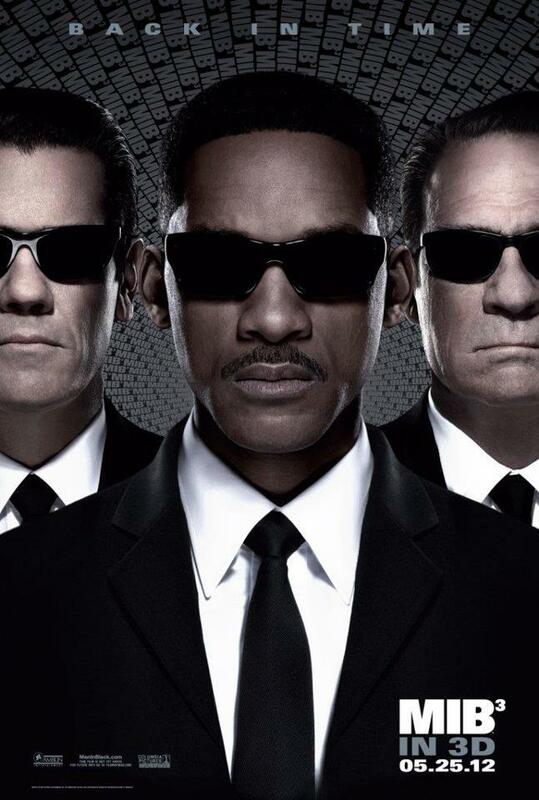 I had plenty of skepticism concerning the notion of a second sequel, but with further potential in the Men In Black universe to be explored and the notion of having a likable Will Smith back on the big screen (he’s been exploring darker film characters as of late), I was still curious to see what could come from this film. It was to my surprise that I enjoyed the film a lot more than I was anticipating. I can get the bad out of the way first. 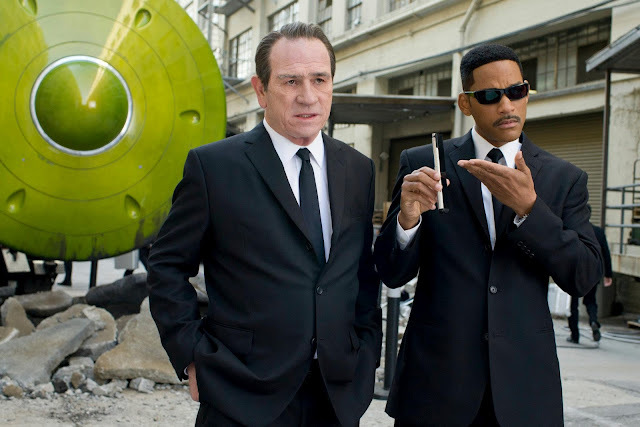 Similar to another big blockbuster film that is currently dominating the world, Men In Black 3 opens rather clumsily. The villain is introduced, which is fine (and does a good job of showing that there will be an alarming amount of death in the film), but the job done to quickly re-establish the world that this film exists in does not go over the best. The humor is a bit off and neat alien designs only get you so far. I was worried this was going to be like the first sequel all over again. Fortunately, once the film really kicks into gear, it becomes a lot of fun to watch. 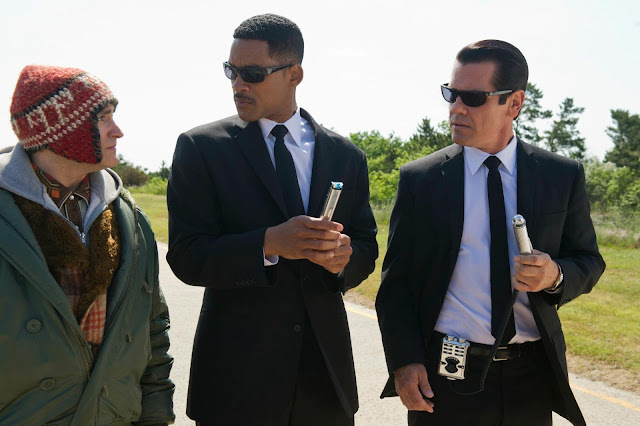 Men In Black 3 is a rarity in the way that its momentum builds up from a weak first act, to a good second act, to a pretty fantastic third act and closing. 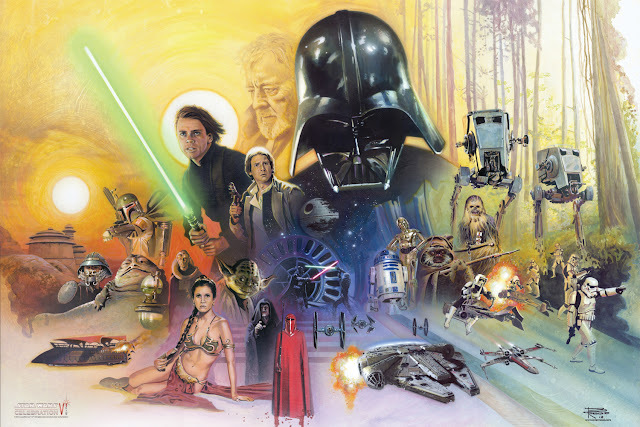 Other opinions about the first two films aside, their endings were always weak points to me. Men In Black 3 manages to have an incredibly exciting ending, which is balanced by a surprising level of emotional resolution and a fine final coda. With all three of these films having been executive produced by Steven Spielberg, this is the first one that actually feel like some of his influence was at hand. I have yet to make mention of the series’ director Barry Sonnenfeld, but I will now. 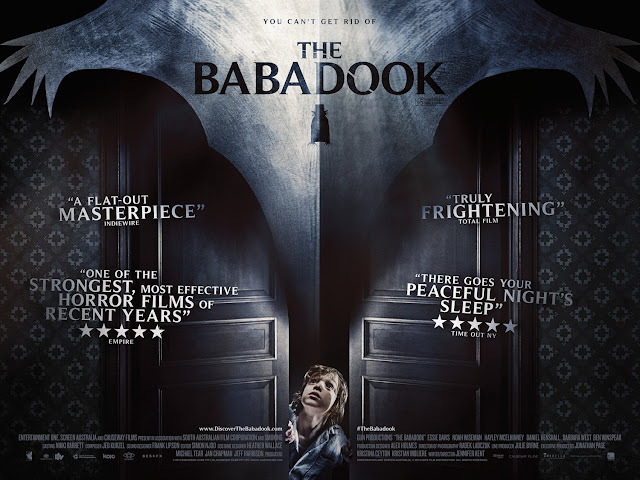 While it could have been easy for him to sit back and be on autopilot, this may be the most energetic directorial work I have seen from him since The Addams Family movies from back in the 90s. While I enjoy Men In Black (as well as another great film of his, Get Shorty), I am a fan of Sonnenfeld’s more visually intriguing days back when he was beginning as a director and coming off of working as a cinematographer for the Coen Brothers, among others. In Men In Black 3, Sonnenfeld really puts his personality into the filmmaking, aided by cinematographer Bill Pope, who is no slouch either. The world is visually dynamic enough, but the aggressive filmmaking (as far as sci-fi comedy goes) worked in this film’s favor, especially given the presence of 3D, which on a scale from “don’t care” to “whatever” was just fine. Agent J: I’m getting to old for this. I can only imagine how you feel. Back to things that may matter more to people, Will Smith knows how to entertain, reaffirming why his name can still sell a movie, while many others cannot quite pull that off on as massive of a scale. Even in a film like this, which really is pretty throwaway overall, despite being enjoyable, the film can easily find an audience because it is fun. 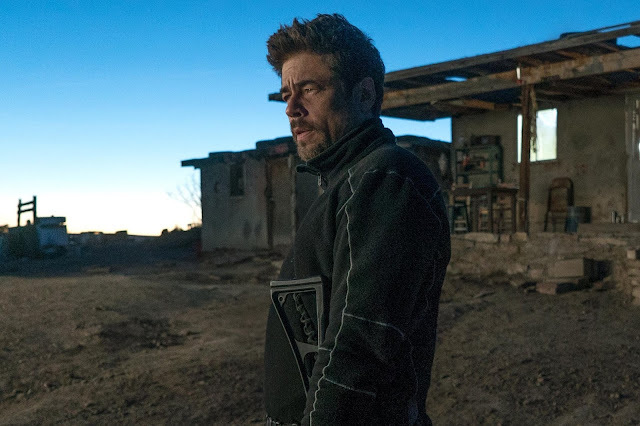 Smith continues to have fine chemistry with Tommy Lee Jones (who is basically in the film for about 15 minutes), but it fortunately carries over to Josh Brolin. Brolin is great here, doing a spot on impersonation of Tommy Lee Jones that goes further than just doing the voice. The attitude of K is present within Brolin’s performance, but the added elements that speak to the different time period that this K is from are neatly presented as well. There are two other cast members worth noting. Clement is given little development as a character, but he certainly sinks his teeth into being quite evil. The design of his alien character is somewhat terrifying if you think about it, but it essentially merges a crazed motorcycle rider with a type of species that can come apart and attack you with its self-aware appendages. It is weird to describe and look at, but certainly a viable threat. The other character is Griffin, played by Michael Stuhlbarg. Griffin is a fifth dimensional alien who can see into other timelines and know every possible outcome of a situation. This is incredibly intriguing in and of itself, but Stuhlbarg gives a wonderfully warm performance that has a great deal of pathos within it, making the character very engaging. The effect work is of course fine as well. Despite having plenty of CG to go around, I have an appreciation for the level of detail in all of the character designs as well. The series has always enjoyed its goofy side, which is definitely present here (despite the MIB masking the world from Aliens, it seems ridiculously easy to discover them), but the work done in creating these aliens is often inspired. Having the majority of the film set in 1969 is fun as well, although it was refreshing to not see too much time spent on many of the obvious jokes that could been made (and I really liked Bill Hader’s Andy Warhol). I have already mentioned the somewhat limp opening. Writer Etan Cohen was apparently joined (uncredited though) by David Koepp and Jeff Nathanson in developing the screenplay. 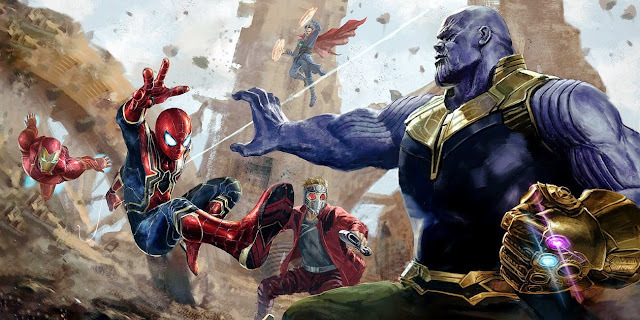 Whatever happened, as I have already stated, things got better as they went along, but I could spend tons of time over analyzing the time travel aspect of the film. I will just say this, time travel logic is always intriguing to me in the ways it occurs in different films and how the rules are established. 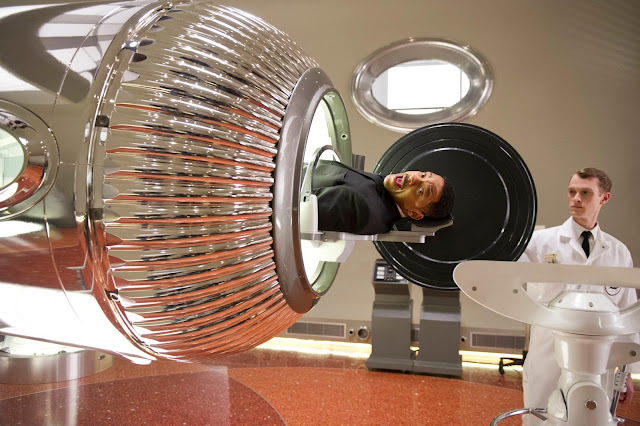 Men In Black 3 plays a bit too fast and loose with its time travel logic, but once again, the ending pushed things far enough in the right direction for me not to be too bothered by this. Again, similar to that other box office whale currently in theaters, Men In Black 3 could have easily been a huge disaster. 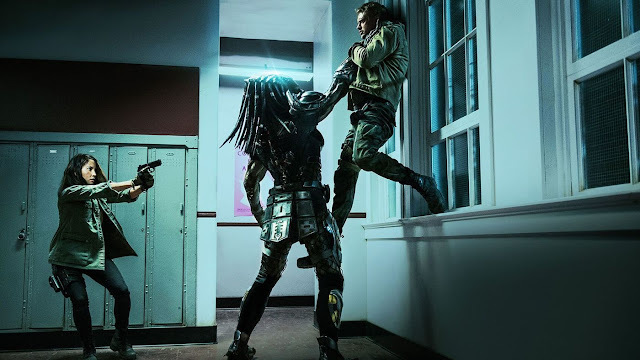 Given the negative publicity (which amounts to its production costs and starting production with an unfinished script), this could have been a film that fell flat on its face. Fortunately, it manages to be a lot of fun, especially once it really gets going. While not a fiercely ambitious film, it does have a lot of clever ideas, a good dose of humor and wit, and an ace in the hole in the form of several actors that do a lot of good in bringing something extra to the film. Now if only this film could have ended with a new Smith rap single to solidify this 2012 Big Willie Weekend. Great review. 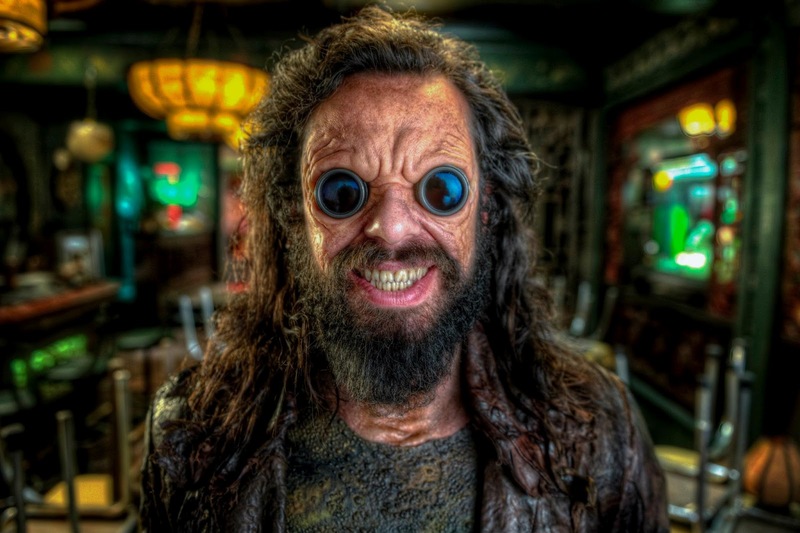 I have a question: I loved the first Men in Black. I haven't seen the second, nor do I truly plan to, due to its negative response. 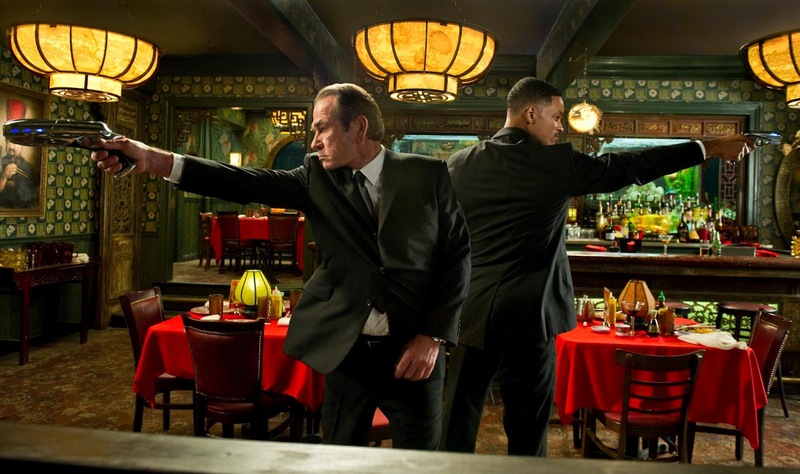 It's been over a decade, nearly a decade and a half, since we saw Smith and Jones last appeared together for a MIB movie. Do you suppose I could enjoy MIB³ without having seen MIIB? Good question. Since one can easily figure out that K is back in the Men in Black, despite retiring at the end of the first, there are no real details that are crucial to enjoying the third without having seen the second film. Men in Black 3 works just as well as a standalone feature.